A spacious two bedroom pole cottage nestled under mature gums, high on a hillside in Endsleigh Valley. The carpeted bedrooms are at either end of the large living/dining/kitchen area and each has a king size bed(no Splitting) full length curtains and ensuite bathroom with tiled open shower. Quality bed linen, fresh from being line dried in the Hawkes Bay sun! The cottage is double glazed and both bedrooms and living areas open on to a full length deck. The cottage is raised on poles to fully take advantage of the stunning views down the valley. It has a full equipped kitchen, indoor and outdoor dining options, BBQ plus indoor wood burning fireplace . An extra single bed can be added to the TV nook area. Share a wine on the deck, the stars overhead and the twinkling valley lights. Perfect! The latest addition to the Ribbonwood collection, a one bedroom, shabby chic styled, fully renovated bungalow beside a landscaped pond lower in the valley. Many original features preserved. This is something truly special for couples that wish to escape. 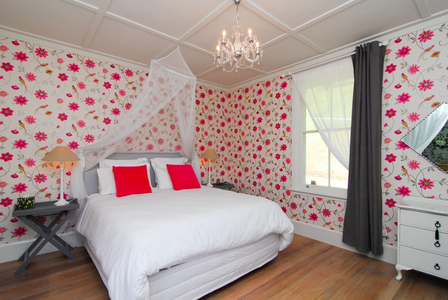 Fireplace for cosy romantic nights, luxurious king bed, soak in a French tub with bubbles and bubbly or share a shower! Quality bed linen, fresh from being line dried in the Hawkes Bay sun! Perfect for honeymooners, birthday or other celebrations. Plenty of outdoor entertaining space and parking to host friends for a BBQ or cocktails .This is something very special! 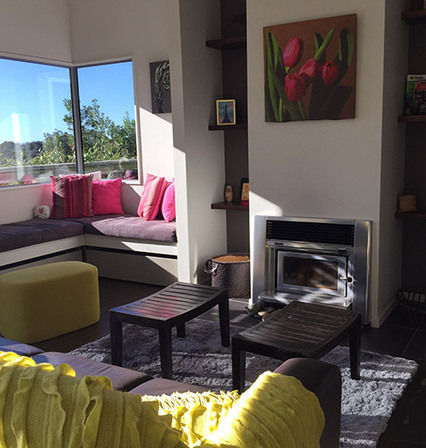 A two level,modern house, decorated in a fresh, slightly funky way. A warm inviting home with many entertaining spaces. Double glazed, with a gas fire. Perfect for groups or large families. A Pepper tree lined driveway approaches the two level house with dual carport. 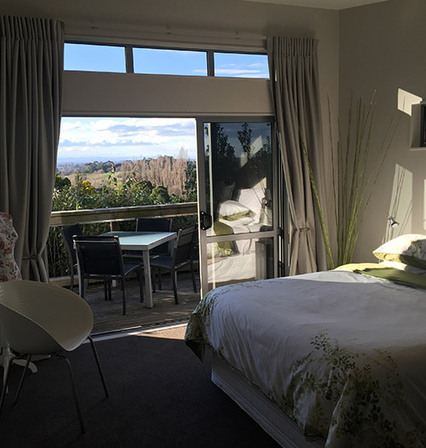 The Lodge is in the Endsleigh hills positioned to the sun and the fabulous views. Framed by a large flat lawn bordered by a Hebe hedge, Haha and an additional sloping lawn that has the washing line. Downstairs you enter through the bright orange door into the foyer and through to the open kitchen/dining/lounge area. The white dining table seats 6-8. 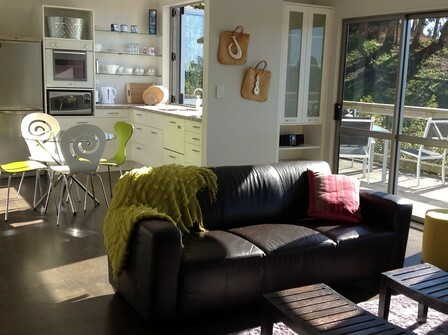 The sunroom closest to the kitchen has vistas to Te Mata peak and has a small breakfast table with stools. This sunroom has bifold doors that open on to the deck area and additional seating. At the far area of the main lounge is another seating area that overlooks the lawn. Much of the artwork in the house is by local artists. Off the main lounge area is a media room with sliding doors for darkness or privacy plus at the far end the master bedroom with ensuite. All the lounge, dining areas and master bedroom have stacking slider doors to open up the rooms to the outside. A guest bathroom that also is a shower room is off the entry foyer. The laundry area in the garage is past the guest bathroom. The garage is not available for cars as has been divided up for owners storage but there is a double carport. An outside shower and small spa plus BBQ , can be accessed from the laundry area or from the sunroom. Upstairs are two king bedrooms, a self contained kitchenette/lounge area and a full bathroom with double basin vanity, shower and bath. Quality bed linen, fresh from being line dried in the Hawkes Bay sun! 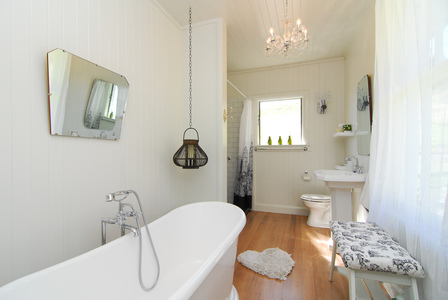 This bathroom can be shared or a third shower room /toilet is available downstairs. An extra 2 single beds can be added if needed to sleep 8 in this upstairs lounge area. 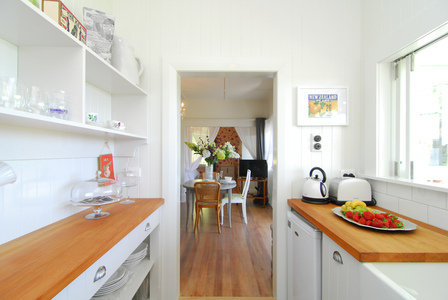 The cottage is double glazed and both bedrooms and living areas open on to a full length deck. The cottage is raised on poles to fully take advantage of the stunning views down the valley. It has a full equipped kitchen, indoor and outdoor dining options, BBQ plus indoor wood burning fireplace . An extra single bed can be added to the TV nook area. Share a wine on the deck, the stars overhead and the twinkling valley lights. Perfect! Pets by prior arrangement with owner only. Pets are welcome inside but not in the bedrooms. Bedding, feed bowls ,toys, grooming brush, poop bags are provided. There is an additional $40 per STAY charge for a pet. Cancellations within 48 hours of your scheduled stay or no shows will still be liable for the full cost of the booked accommodation. Other cancellations however have the option of rebooking your stay with the deposit being transferred to the new booking. 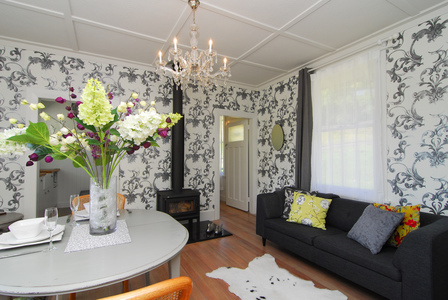 Ribbonwood Cottages are located 4 kms south from Havelock North village in the foothills of Te Mata Peak. The cottages are spread amongst 3 hectares with the 2 bedroom cottages higher on the hill slope and The Loveshack in the valley beside the pond. Lifestyle blocks surround Ribbonwood so its has a tranquil semi rural feel with horses, cows, alpacas, sheep and lots of birdlife. From Havelock North village , head south on Middle Road ( by new World supermarket) for 2.5 kms. Turn left onto Endsleigh Road and continue straight ahead when you reach a T intersection, on to Endsleigh Drive. The Loveshack is on your right & for the other cottages, continue 100 m & take the private drive uphill on your right by the row of letterboxes.